Enjoy a superior collection of knitted lace patterns. 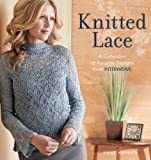 Brought together for the first time, the lace projects of Knitted Lace represent the most intricate, beautiful, and sought-after pieces featured in Interweave’s publications. With 25 unique knitted lace designs, from eyelet scarves to fun socks to elegant tops, Knitted Lace will appeal to both contemporary and heirloom knitters. Inside you’ll learn new techniques as well as time-honored traditional skills of expert lace knitters. Also included in this wonderful lace resource is commentary by knitted lace experts Eunny Jang and Jackie Erikson-Schweitzer, exploring how to follow lace charts, execute perfect stitches, and understand the construction of even the most complex knitted lace patterns.